The technical aspects of performance optimization are indisputably important. But the social work—convincing peers, managers, and clients that performance optimization merits their attention—often gets short shrift. 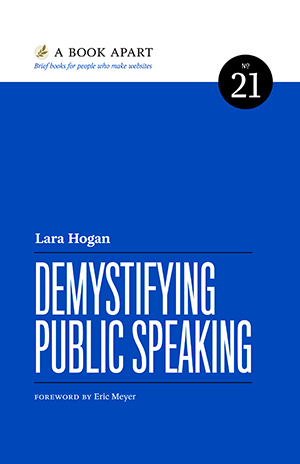 Lara Hogan shows us how we can go beyond charts, graphs, and numbers to show performance rather than merely tell it—and effect a genuine culture shift in the process. Lara Callender Hogan is the senior engineering manager of performance at Etsy and the author of Designing for Performance. She champions performance as a part of the overall user experience, striking a balance between aesthetics and speed, and building performance into company culture. She also believes it’s important to celebrate career achievements with donuts. Great article. I really like the part about the ‘rules’. I love this! Reminds me of watching Anne Lamott speak at Confab a couple years ago. I think she must have broken a thousand rules, including losing focus during the speech, but she had everyone enraptured. Thanks! If we talk real stuff, the people care about everything when it is about what the others say. According to me, the key of public talking is the body language together with the charisma of moving around. According to me, the key of talking to public is the body language, because the people will always care about what the others think about them. One of the people I look up to says that you will start having success in what you do when you skills outweigh your fear. When you are a rookie at public speaking, you don’t have much skills, and a lot of fear. You gotta just tell yourself that the more you do this, the better you get, and that fear will go down as those skills go up. Soon enough, you will be a pro!